Soil salinity is an environmental and agricultural problem in many parts of the world. One of the keys to breeding barley for adaptation to salinity lies in a better understanding of the genetic control of stomatal regulation. We have employed a range of physiological (stomata assay, gas exchange, phylogenetic analysis, QTL analysis), and molecular techniques (RT-PCR and qPCR) to investigate stomatal behavior and genotypic variation in barley cultivars and a genetic population in four experimental trials. A set of relatively efficient and reliable methods were developed for the characterization of stomatal behavior of a large number of varieties and genetic lines. Furthermore, we found a large genetic variation of gas exchange and stomatal traits in barley in response to salinity stress. Salt-tolerant cultivar CM72 showed significantly larger stomatal aperture under 200 mM NaCl treatment than that of salt-sensitive cultivar Gairdner. Stomatal traits such as aperture width/length were found to significantly correlate with grain yield under salt treatment. Phenotypic characterization and QTL analysis of a segregating double haploid population of the CM72/Gairdner resulted in the identification of significant stomatal traits-related QTLs for salt tolerance. 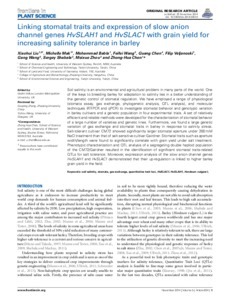 Moreover, expression analysis of the slow anion channel genes HvSLAH1 and HvSLAC1 demonstrated that their up-regulation is linked to higher barley grain yield in the field.